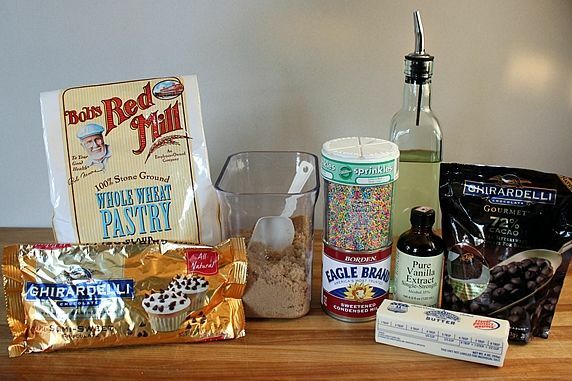 I use this healthy, whole grain flour in place of all or part of white flour in many recipes. It contains all of the wheat berry's healthy and natural elements - the germ, endosperm and bran - yet it has a lighter texture than regular whole wheat flour. 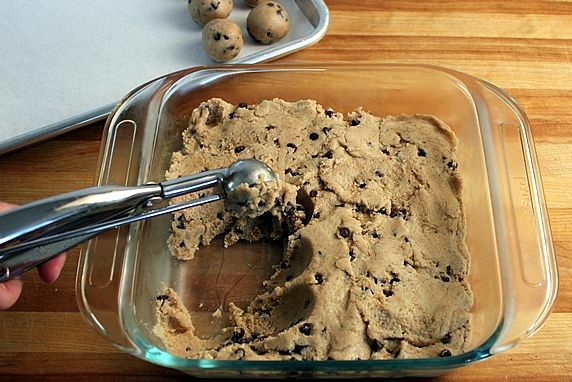 This adds a nutritional punch that disappears into the cookie dough. 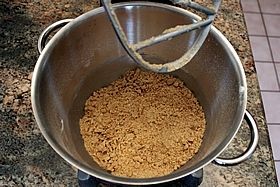 Ground meal is preferred over whole flaxseed for better nutrient absorption. A handy tool for these truffles, cookies, meatballs, and scooping tidy, uniform portions into muffin tins, ramekins, and more. This has similar health benefits of olive oil with a milder, lighter taste. 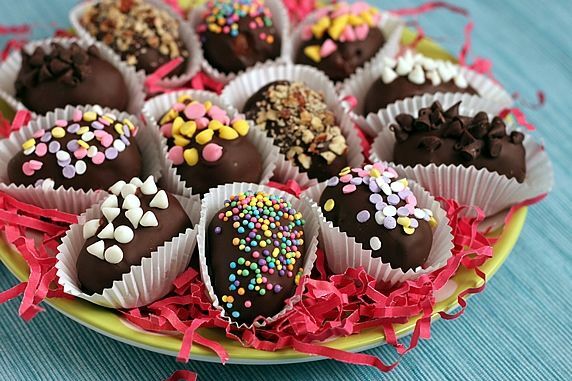 That makes it a great choice to melt with the chocolate chips for dipping these truffles. I also use it for baking, salad dressings, and sauteing, when I prefer a flavorless oil. It's also recommended for use as a skin moisturizer. This recipe tastes like the original but uses 100% whole wheat flour and flax seed. Shape these yummy treats into round or egg shapes. 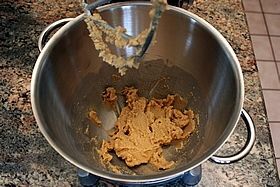 With a stand or hand mixer, cream butter and brown sugar in large bowl. Add vanilla and mix. 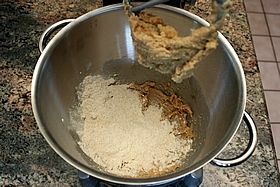 Add flax seed and flour 1/2 cup at a time, mixing after each addition. The texture will be dry and crumbly. With mixer running, gradually pour in canned milk. 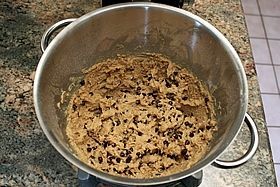 Fold in chocolate chips and nuts (if using). Cover and chill dough for 2 hours. 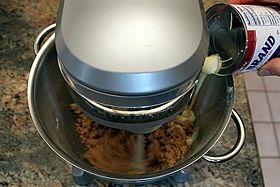 Use scoop or hands to form generous 1 tablespoon, walnut-size balls of dough. May be formed into egg shapes, if desired. Return to fridge while preparing chocolate. 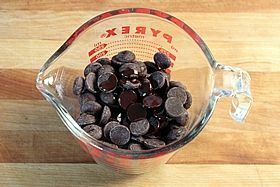 In microwave safe bowl, microwave at full power 1 cup chocolate chips with 1 tablespoon oil in 20-30 second intervals, stirring each time, until chips are melted. Do not overcook. (Melt remaining chocolate and oil in same way, in second batch after this one is used up.) 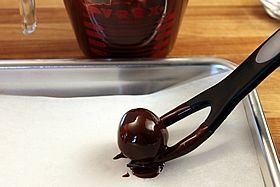 Dip dough balls/eggs in melted chocolate using a fork. Shake and scrape off excess chocolate from bottom and place on parchment or waxed paper lined tray. 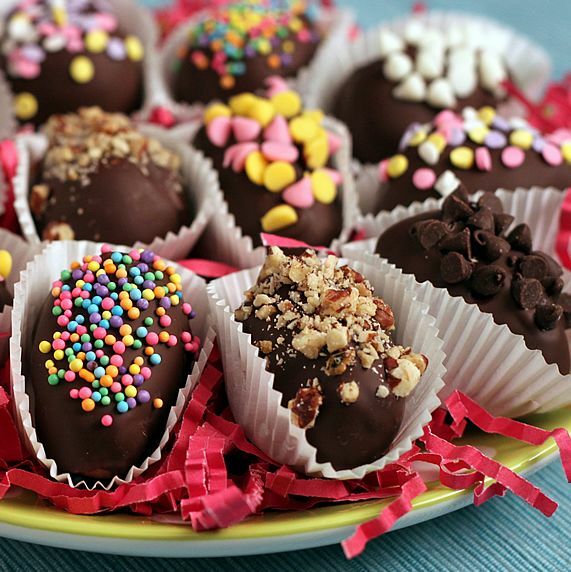 Top with sprinkles, nuts, or mini chips while chocolate is still wet. Let set until dry. Use a paring knife to trim any hardened puddles around the bottoms of the truffles. Store in fridge. Will keep for several days. Best served at room temperature. Today's post is in honor of T-Man's birthday. Our 2nd born son. The youngun of the family. The techie guy who makes The Yummy Life work. Technically. 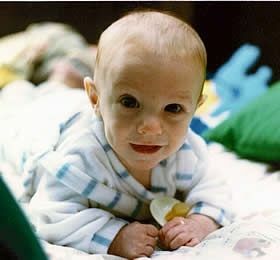 If you'll indulge me while I show off a baby photo (we moms never tire of that), here was baby T-Man 26 years ago. What a cutie, if I do say so myself. T-Man lives in San Francisco now, so I can't deliver a birthday cake to him. Instead, I made something I know he'll like that can survive being shipped in the mail. Today, T-Man is receiving a box with my healthier version of Rice Krispie treats (a forever favorite of his) and some Chocolate Chip Cookie Dough Truffles. I'd never made the truffles before, but he has always been a kid who loves cookie dough; so I'm pretty confident he'll like them. UPDATE: This post was originally written in 2011, so T-Man is older now; but he still loves anything chocolate chip cookie dough. This recipe is a tried-and-true favorite now. 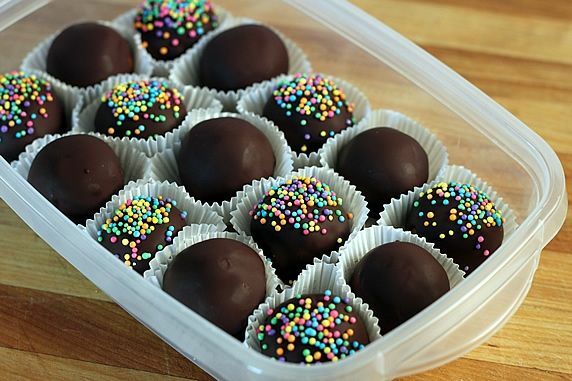 My long-time friend Sheri of The Loopy Ewe, shared her cookie dough truffle recipe with me over 5 years ago. Sheri and I have shared a lot of recipes through the years. She's a great cook. 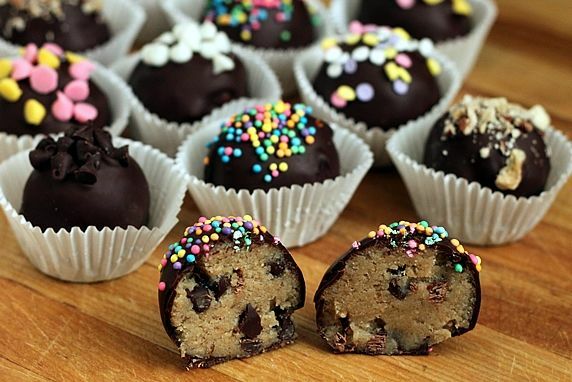 So, I have no idea why I've waited so long to make cookie dough truffles. 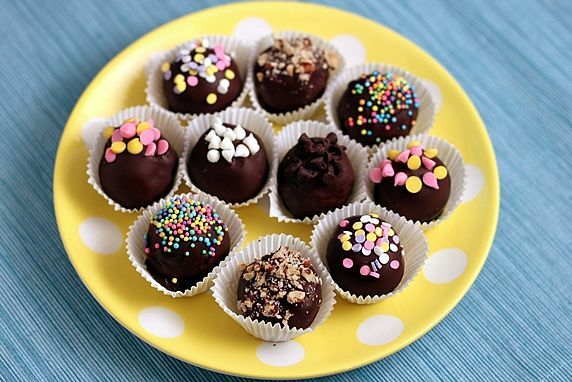 Then I came across some beautiful cookie dough truffles from Lori at Recipe Girl. Her recipe is almost identical to Sheri's. It was time to give this a try. Healthified a bit. 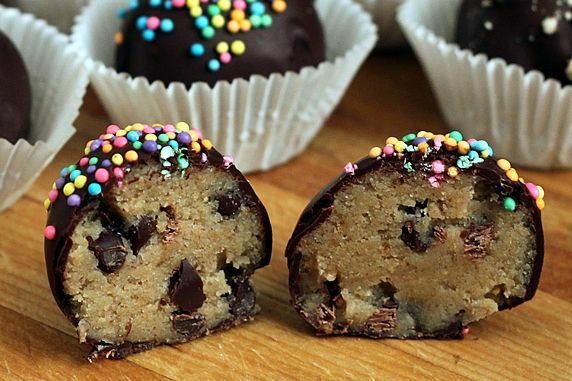 I'm not saying these are healthy, but they are healthiER than your traditional cookie dough truffle. Being a mom who has few opportunities to provide nourishment to my adult children any more, I couldn't resist the temptation to sneak some healthy ingredients into the recipe. (Shhhh, don't tell T-Man!) So, I substituted whole wheat pastry flour for white flour, and threw in a little ground flax seed. I honestly can't tell any difference in taste from the original; so, why not make it a little healthier less unhealthy while I'm at it? I also melted 72% cacao dark chocolate for dipping the truffles--the darker the chocolate the higher the antioxidants. Plus, T-Man loves dark chocolate. This isn't normally considered a "melting chocolate", but it tastes fantastic. It has more of a satin finish than a glossy one like the melting chocolates; but it's still pretty, and it tastes so much better. In addition to T-Man's birthday truffles, I made some egg-shaped truffles, since Easter is coming up soon. Killed two birds with one stone recipe, I guess you could say. Step 1. 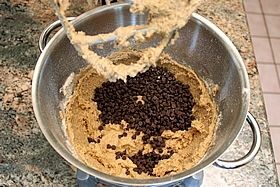 Assemble the ingredients: whole wheat pastry flour, ground flax seed (oops, not pictured), brown sugar, sweetened condensed milk, vanilla, butter, mini chocolate chips, vegetable or grapeseed oil, chocolate for melting. Step 2. 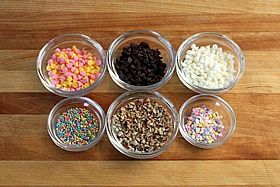 Gather some sprinkles, mini flavored chips, and/or chopped nuts to use for topping and decorating the truffles. 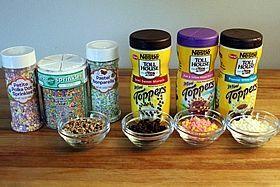 Target had these Nestle Toppers--really just mini flavored chips. They even had some pink and yellow ones for spring. Step 3. 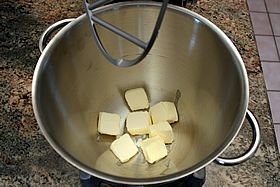 Add the butter and brown sugar to a mixer bowl. Step 4. Mix those until creamy. Step 5. Gradually add flour and flax seed. Mix it in. Step 6. 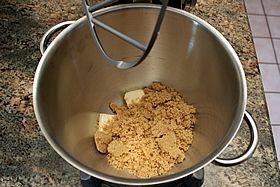 With the mixer running, gradually pour in the sweetened condensed milk. 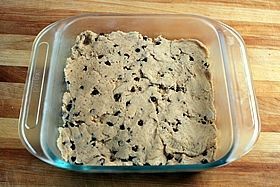 The canned milk substitutes for eggs in traditional chocolate chip cookies dough. That way it's safe to eat it raw. Step 7. 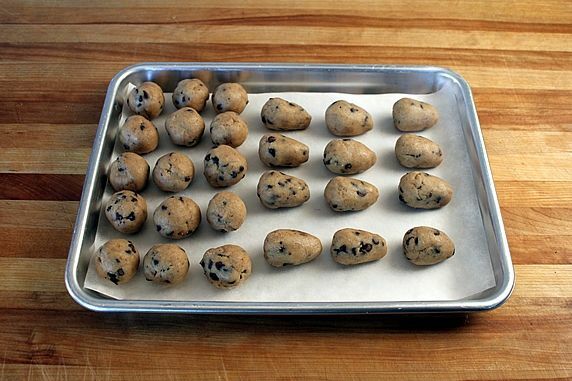 Add the mini chocolate chips and fold them in. You can fold in some chopped pecans, too, if you want to. I left out the nuts, because T-Man doesn't like nuts in his cookie dough. Step 8. Cover the dough and chill it for at least 2 hours. You can shorten the chill time by spreading the dough in a thin layer in a pan before putting it in the fridge. Step 9. Use a scoop or spoon to make approx. 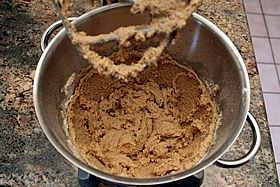 1 tablespoon portions of dough (walnut size). Roll them between your hands to make them round. I also formed some of the balls into egg shapes to have for Easter. Step 10. 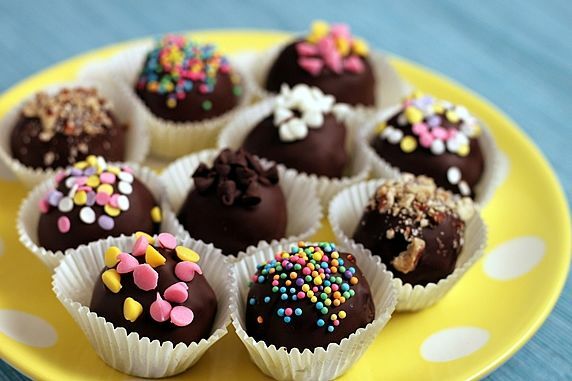 Put the dough balls/eggs back in the fridge while you prepare the chocolate for dipping. Step 11. 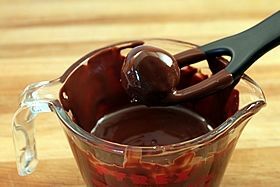 Melt 1 cup of chocolate pieces with 1 tablespoon of oil in the microwave. Heat it in 20-30 second intervals, stirring each time, until melted. Don't over cook it! Step 12. 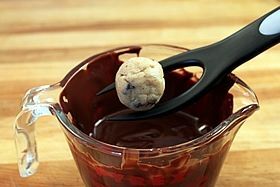 Use 1 or 2 forks (a 2 pronged fork works well, if you have one) to dunk the dough balls into the melted chocolate. Step 13. Let the excess chocolate drip off, and scrap the bottom against the rim of the bowl as you remove them. 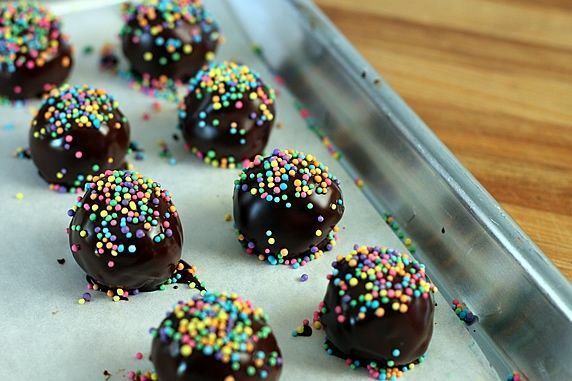 Place the dipped balls on a parchment or waxed paper covered baking sheet. Step 14. 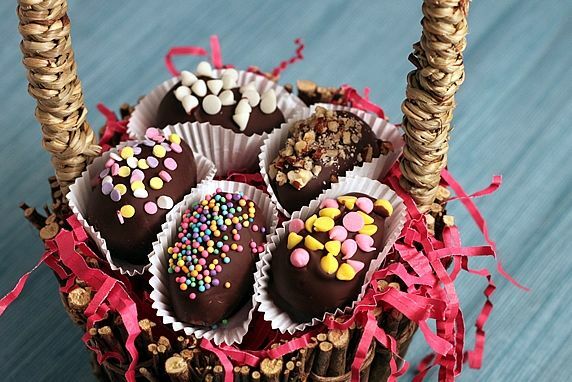 While they're still wet, sprinkle toppings onto dipped truffles. I added festive sprinkles to these for T-Man's birthday truffles. The melted chocolate may puddle on the bottom. Once they've hardened, you can trim around the bottom with a paring knife. These are the cookie dough truffles I mailed to T-Man. Although these need to be refrigerated if you're keeping them for several days, they can make an overnight express mail trip just fine without refrigeration. I don't think I'd attempt mailing these in hot weather, though. 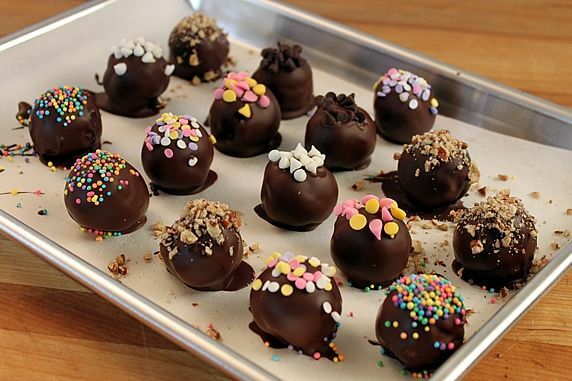 This recipe makes 4 dozen truffles. So, here's what I did with the rest of the batch. 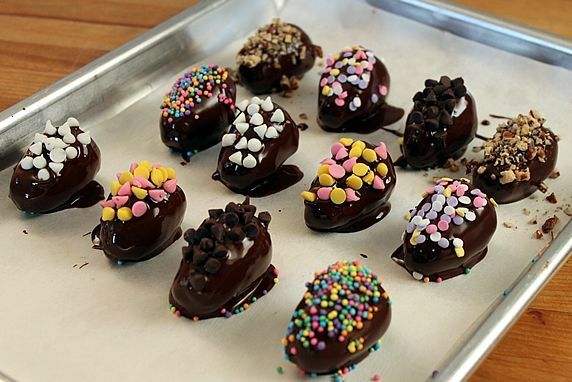 I dipped and decorated the remaining truffle balls with a variety of toppings. I stuck with spring/Easter colors, but they could be decorated with appropriate colors for any occasion. These are better made a day ahead, allowing the flavors to meld. They should be stored in the fridge, but they taste better eaten at room temperature. Putting them in mini paper baking cups makes them easier to serve and eat. Plus, they look pretty that way. Look at that yummy cookie dough inside. 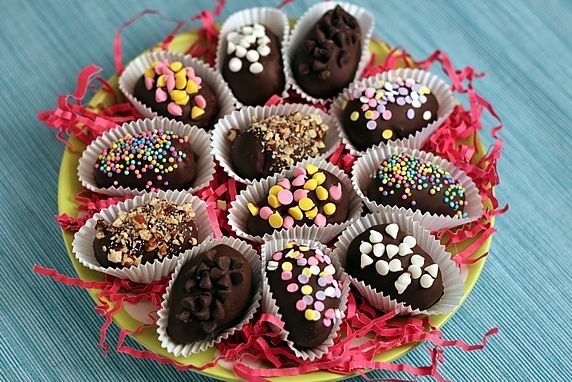 I also dipped and decorated the egg-shaped truffles. The look pretty on a plate with some Easter grass. Or, put them in an Easter basket. Happy Birthday, T-Man. I hope the treats from home make your day yummier. This post was updated 4/6/2014.